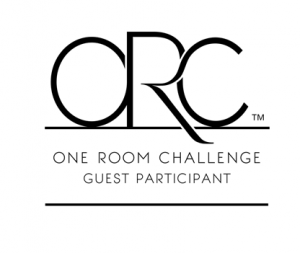 Hello my friends, this is our fourth time as a guest participant in the One Room Challenge. 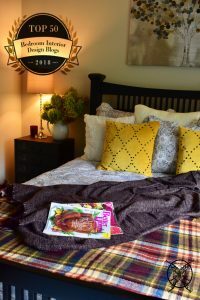 This season we are super excited to be featuring a Rustic Guest Bedroom design. 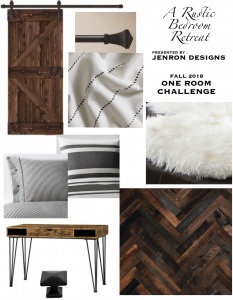 This season we will doing a rustic guest bedroom located next to the on- suite Jack and Jill Bathroom featured in the Fall 2017 One Room Challenge. 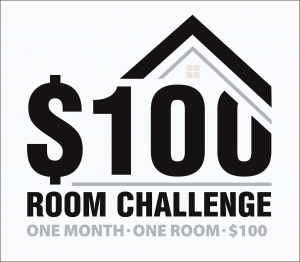 If you have not seen this challenge be sure to check it out, to get some inside on where we are going this time. This season we have decide to give a facelift to the bedroom located directly next to the on suite Jack & Jill Bathroom seen ORC Fall 2017. This bedroom has had a few different looks since we moved into our home in 2015. You may also remember this Guest Room was also featured in our post last season on 5 Tips for Creating the Perfect Guest Room, which won us notoriety for the 2018 Top 50 Bedroom Interior Designs Blogs Award. Below is a more current day photo of the bedroom in it’s more recent state of decor. As you can see is we have kept it very light and airy, and just a basic guest room feel. 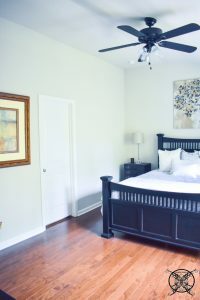 However, I have really been wanting to add some personality to this room and I have been picturing a rustic wood accent wall behind the bed for quite sometime. 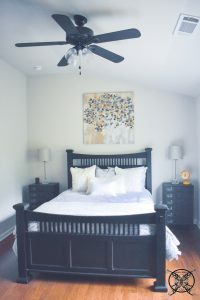 I love this queen size mission style bed and believe it will continue to serve us going forward with the style we have chosen along with the industrial style nightstands and I am currently still undecided on the lamps but everything else will be leaving us. As I mentioned above this room is located next to the Jack and Jill on suite bathroom which desperately needs to have a sliding barn door installed to remove one of the four doors located in this bathroom, which in my opinion is just to many doors for one space. The door below on the right wall is the one we will be replacing with a barn door which will make sense in the bathroom. 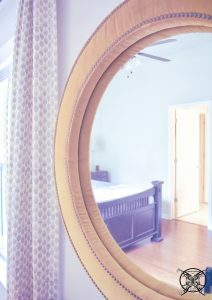 You can also see another perspective in the mirror reflection below, which will be going bye bye, along with those drapes. Again adding a sliding barn door to the bedroom side of the equation will really free up some space along with adding some visual interest and character for that large empty wall space. The final addition to this room is the addition of a flat screen television that will be mounted on the far wall. We have planned to install the television so that the equipment will be housed in the closet behind this wall so it will be able to float on the wall with no cables, jacks or plugs. This is a big thing for me, I hate to see cords and cables. While I know they are a necessity, I think they ruin the esthetic appearance of a room, so if you can hide them away you should. So we will be doing a DIY How To Make A TV Pretty. So, I can hear you guys already saying; Jen why are you redesignin this room, it looks fine? 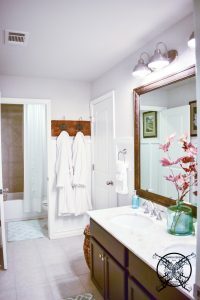 Well the answer to that is really very simple, since we decided to upgrade the on suite bathroom just next door, I have really wanted a sliding barn door to alleviate the mass amount of doors in the Jack and Jill bathroom. 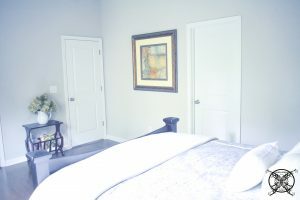 So If I am going to add a sliding barn door….. of course I want to change up the design of the room to match it, right? I guess it is that whole, “If you give a mouse a cookie” scenario…… you know the children’s book? It says if you give a mouse a cookie he will want a glass of milk, then he requests a straw because he does not want a milk mustache, but by the new laws you can’t have a straw anymore……so there you go! This is a basic outline of my inspiration for this room. As I stated above, the key piece to this design is the addition of a sliding barn door to alleviate several doors located within the previously designed on suite bathroom. The addition of the rustic sliding door inspired a vision for a reclaimed accent wood wall, that will be installed with a herringbone pattern as seen below. This will become the focal wall located behind the bed. This room will also require the addition of a flat screen television, writing desk, new linens and we are in the process of having a hand painted wood sign made for over the bed, my friend Audrey over at Six Twenty Two Designs is working on it, so we should be seeing that pretty for the reveal. This is such an amazing room and project great job! 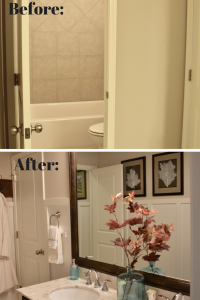 Sometimes all you want is a small change in your home that can make a big difference. Can’t wait to see the final reveal. I love your ideas, especially the black and white, they’re going to look so great in the room. Can’t wait to see it all done! Jen – this is going to be amazing! How fun to be following along with you on another ORC adventure! Best of luck, friend and can’t wait to cross the finish line with you! 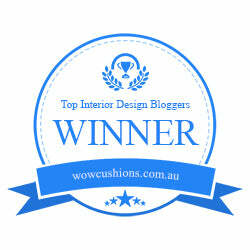 Love, love, love your design plan, Jen! Super excited to see your wood accent wall! I want that porch for myself right now. 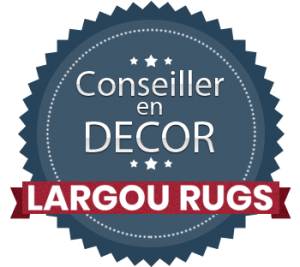 I love the bed and your ideas will certainly improve a room that looks wonderful as is. I’m keen to see how it all turns out. 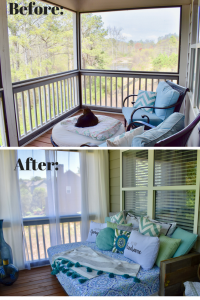 Nicole your should check out the full post, my husband built the day out of pallets and we did deferral fun DIY project for the sleeping porch. LOL I am just not sure I even brought that in to the post, but I guess some time I ramble in my musings!!!! Wow you have skills! I love all the textures! Jen! I am so in love with your plans! And I’m a big if you give a mouse a cookie too…..I just can’t stop haha. Wow! I can’t wait to see the finished result. Oh, I love the bed and the set up of the room. The painting over the bed offers the room just enough color as well! Great choices! I love your ideas and the before and after pictures. It will be fantastic. I like your plans! Excited to see what you do! You’re adding a rustic wall, I’m taking one down haha!! Hey, you can have this wood if you want ;). Excited to follow along! I love the bed, but the porch…got me! I would never leave it! That would be where I would need to add a tv and look out to the sky at the same time! Okay, I know this is about the guest bedroom but that sleeping porch is my dreammmm!! So beautiful! Very fun Jen. Can’t wait to see it all fall into place! I love your plans! That wood wall is fantastic!! Love it. I’ve always been a big fan of the rustic look instead of a new looking furniture or colors. This looks very inviting! Great work! 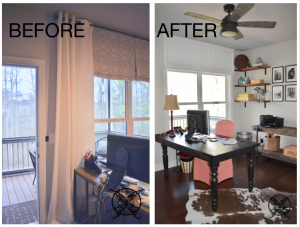 I love the transformation of each space! You have a great eye for interiors and your inspo board gets me excited to see the next steps! This is a great space to work with, Jen! 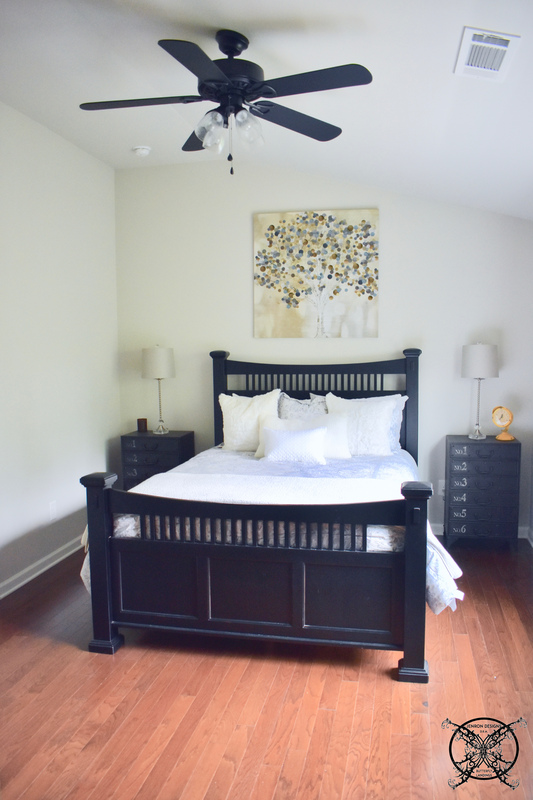 I can’t wait to see how everything you’ve sourced will look in this guest bedroom. Good luck! Excited to follow along Jen! That side table is to die for!!! This is such a cute idea for a guest bedroom. Loving all the pieces together. 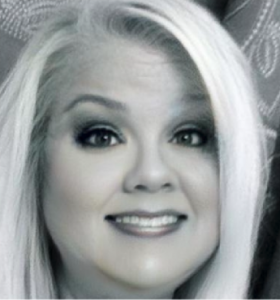 Thank you Susie I am so excited about this season’s ORC I feel refreshed, rejuvenated and ready to take on the world this time! We will see how long that lasts, lol!!!! I love these raw colors. Great job!